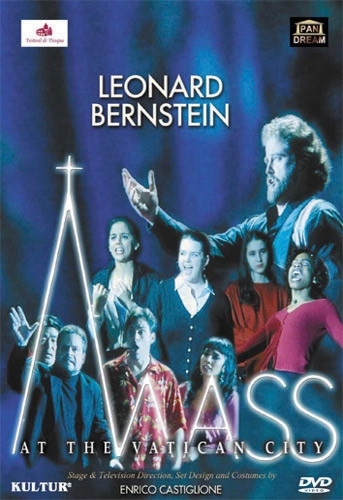 Originally commissioned by Jacqueline Kennedy Onassis to commemorate the memory of John F. Kennedy, Leonard Bernstein's Mass is an exhilarating religious and musical masterpiece. The work is a staggering example of musical eclecticism, mixing aspects of classical, pop, jazz, rock and blues. Rarely performed due to the enormity of the production, Mass features more than two hundred performers among the large orchestra, a rock band, a blues band, 18 soloists, 80 chorus singers, and a company of 45 dancer-singers. 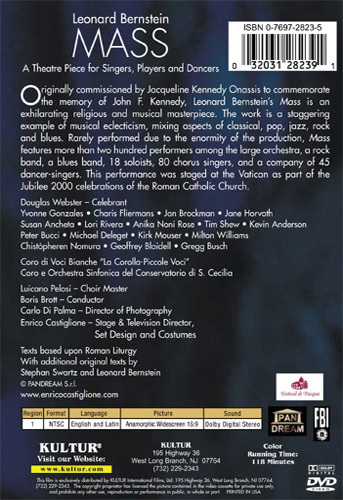 This performance was staged at the Vatican as part of the Jubilee 2000 celebrations of the Roman Catholic Church.